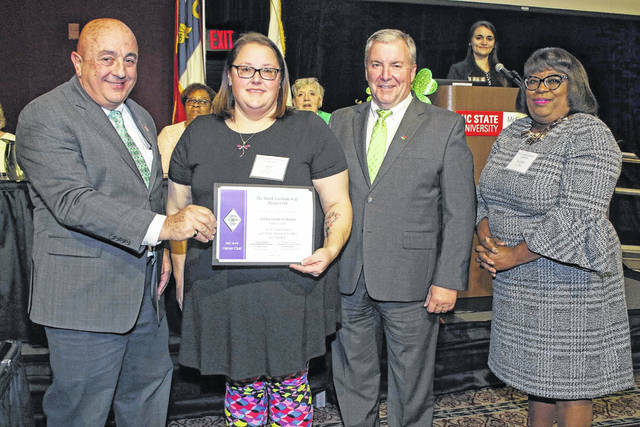 RALEIGH — Many gathered at the McKimmon Center in Raleigh on Feb. 2 to honor 4-H volunteers around North Carolina. One of the recipients for an award that night was none other than our very own county resident, Ashley Doub Wilbanks. Wilbanks received the North Central District 4-H Adult Volunteer Award for her exceptional service to our county 4-H program. She is a 4-H alumni, 4-H Honor Club member, and is the leader of the Panthers 4-H Club located at Courtney Elementary School. Her leadership in the 4-H program stands out in the county. Wilbanks is known for her passion and enthusiasm for 4-H. Along with being the Panthers 4-H Club leader for four years, she has been the leader for many competitions such as the 4-H fair booth and Christmas tree entries for the Dixie Classic Fair. She has also coordinated and designed the 4-H float for the Yadkinville Christmas Parade, volunteered at the Yadkin/Davie 4-H Livestock Show, and has helped with numerous other programs. Wilbanks is certainly an essential part of the Yadkin County 4-H Program. We are thankful for Ashley’s service to our organization and all our other 4-H volunteers as well. They put in countless hours into our 4-H program and we could not have this program without their endless dedication. Madaline Jones is the 4-H agent, youth development for the Yadkin County Cooperative Extension Agency. She may be reached at [email protected] or by calling 336-849-7908. Ashley Wilbanks is presented with an award for her service with the 4-H club in Yadkin County.